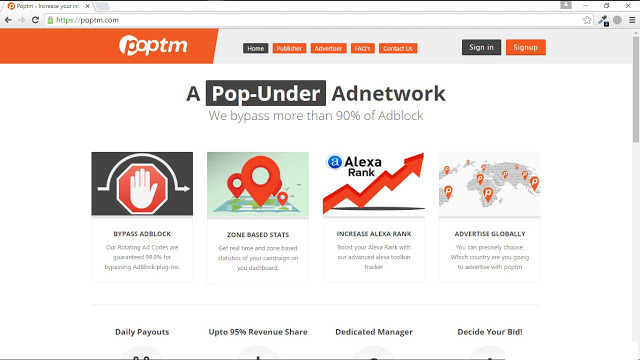 Ads Review - Poptm is a pop-under ad network from India. While Pop-under ads are the types of ads that appear when the user's browser to click any part of a website page. And usually ads will appear in the new window / new tab in a browser. For registration is very easy. There is no special requirement to register. Live register and submit website. And then wait until your website is approve . The process of approve / review your web is quite fast, does not need a day anyway.  - The presence of Bypass Adblock feature, so pop-under ads will still appear even though the browser is tricked with adblock (apps browser plugin, which works so that ads do not appear in a browser). - Can Daily Payout , Your earnings can direct your request if it has exceeded the minimum payout . Minimum payout limit of Poptm is 10 $, with payment can be via Paypal or Payza. 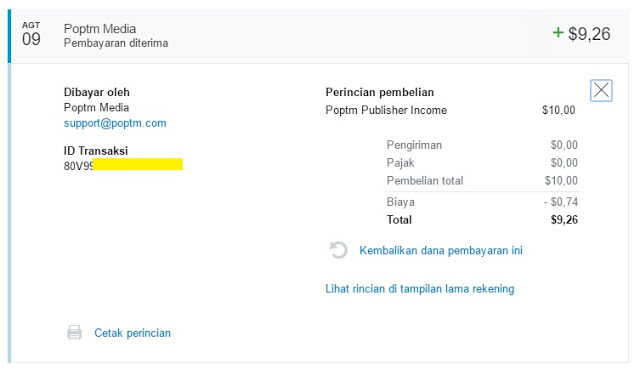 Tips from me do not request payout (PO) on the weekend, because poptm only willing to pay in active day work only. - High eCPM value, with eCPM value and very high impression, then earnings will also get high. From my experience and friends publisher eCPM average ranges from 0.5 $ to 2 $. ECPM will be very high in certain months, depending on changes in the advertising market of Poptm . - User Friendly , Ads only show Per hour from per unique IP or per user browser. So ads will appear only hourly with the same IP user. Then it will not disturb your website visitors. 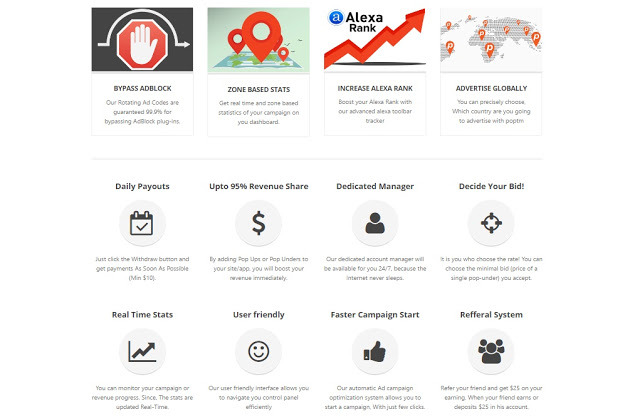 - Realtime Statistic , Advertising statistics you can check any time without waiting hour / per day etc. This is a statistical example of one of my webs, although with relatively small impressions, the daily results-are tolerable. 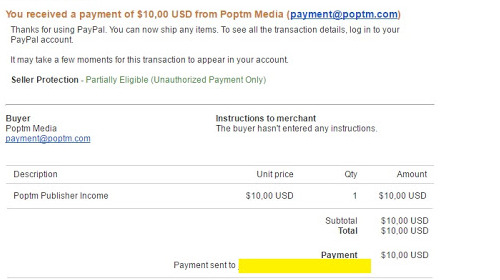 From my experience, the payment from Poptm is very fast, payment sent to paypal only takes less than 10 minutes (See date from above email picture). While the Fee of 0.74 $ from 10 $ payout. Well, interesting is not it? Let's register to the official site poptm.